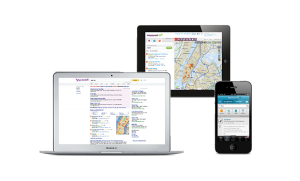 If you own a business with a physical location, it is vital that people searching in your area can find you. It’s not just about SEO anymore you must be listed in Google My Business (formerly Google Maps/Local), Yelp, and other local directories. Considering a large chunk of the searches on Google are being done on a mobile phone it is even more important than ever. When a potential customer is searching for a service provider the chances are pretty high they will click a listing on Google Maps, will they find you? In an effort to give local businesses a chance to compete with the huge companies with even larger budgets, Google created a service called Google Places. It allowed businesses, even ones without a website, to have an online presence that could compete with the big businesses. When a company provided a few basic pieces of information like name, address, and telephone number they could create a free listing. The more details you added, the more likely you were to show up when people were searching in your area. Fast forward to today, Google renamed the service “Google My Business” but the basic concept stayed the same. What is a Local Business Directory Listing? Realizing that people wanted a voice to tell their story, positive or negative, with local businesses websites began popping up allowing them to do just that. A few of the larger ones are Yelp, Bing, Merchant Circle, City Search, and Superpages. Each of these sites will allow businesses to submit their information to have a listing in the directory. While you may not be a heavy user of these sites, there are a large number of people that do use them. If you don’t exist in the directory anyone searching won’t find you, even more if they have the wrong information then that potential customer will not be able to contact you. You might be surprised how often this happens. Is your business listed with the correct information? Use our free checker now, and find out, it only takes about 3 minutes. The optimization process begins with Google the hottest one of them all. Making sure your listing is filled out completely with the correct information will confirm you are a trustworthy legitimate business. From there we make sure your business information is listed correctly in over 50 of the most popular directories and that the information matches what Google has. By doing this, we are confirming to the big G that they have the correct information, and you are still in business. Next we seek out other directories that are specific to your geographical area or your industry. By getting your business listed, we are proving more and more that your business is the ideal choice for searchers. We mentioned above how important this service is for businesses with a physical location, but it is also vital for service providers like plumbers, electricians, and other contractors. Even if you don’t fit into either of these categories, it may still be a good idea to get your business listed. Each directory your business is listed in shows proves your legitimacy and also provides a backlink to your website. Meaning it can also help your search engine optimization efforts. The listing service is not ideal for businesses that only sell products on their website and don’t have a local presence. Also, if you promote a network marketing or MLM type of product it most likely won’t be a good fit. Just like any service it depends on your business and what all you need. Optimizing a Google My business page depends on your business, which is why we have to provide a custom quote for each business. For businesses that need the directories in our free checker created, updated or corrected we offer this service for $150. The next step is to fill out the Exploration Form to see if you qualify, once you have submitted the form we will contact you in less than one business day to setup an appointment.